For larger industrial applications, Simtech offers a line of heavy-duty fiberglass reinforced simplex and duplex basket strainers to stand up to the harshest conditions of service and plant environments. 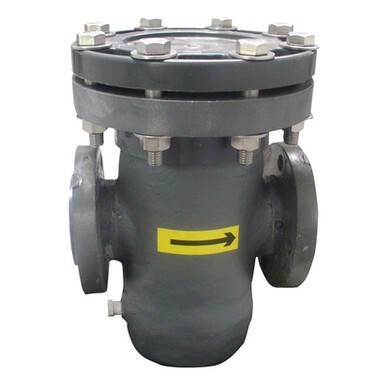 The BST (simplex) and BSD (duplex) series is an industrial-grade strainer – not suitable for pools – that is designed for strength and corrosion-resistance at higher temperatures and pressures than typical plastic basket strainers. Our design utilizes a composite laminate construction for strainer bodies and components to provide structural strength and optimize chemical resistance. The thermoplastic liner pipe is over-wrapped with an FRP reinforcement stratum and finished with a resin gel coat. Chemical resistance is maintained by providing all wetted surfaces in the material of your choice: PVC, CPVC, PP or PVDF. Available in both single basket (simplex) or double basket (duplex) configurations in sizes from 3” to 24”. 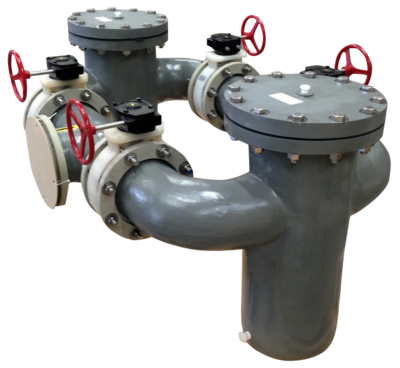 Duplex strainer design eliminates any down time.